Beeson-Foss Ranch includes orchards, irrigation features, barns, and outbuildings, along with the historic house. The area around the house is fully landscaped with a lawn, shrubs, several mature trees and a wood fence. Two non-historic, non-contributing buildings are on the property, a garage and a 1997 dwelling. The walnut orchard retains its late 19th and early 20th century plantings, intermixed with newer walnut and other tree crops arranged in regularly spaced rows with open agricultural lands surrounding the centrally located cluster of built resources. 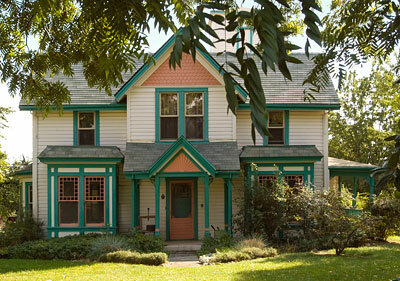 The original portion of the house was built in 1863 in the shape of an octagon for Welborn and Mary Catherine Beeson. In 1893, it was modified to its present appearance by its second owner, Julius Foss. Foss demolished the front four sides of the octagon and replaced them with a more traditional I-form vernacular volume with modest Italianate elements. The rear four walls and roof of the Beeson dwelling remain essentially intact. As completed in 1893, the Beeson-Foss House was considered one of the finest rural residences in the Wagner Creek area. Adapted from the NRHP nomination submitted in 1992.